Burton and friends, Darius Allen, a freshman majoring in electrical engineering, and freshman Karah Anthony, nursing major, were participating Tuesday, Feb. 10, in the Cougar Craze activity. 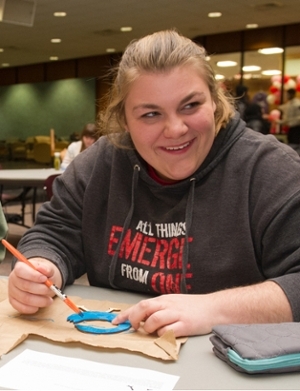 This month’s arts and crafts activity coincided with SIUE’s Black Heritage Month. Students could paint wooden Sankofa birds or plastic cell phone cases in African inspired designs, if they so desired. 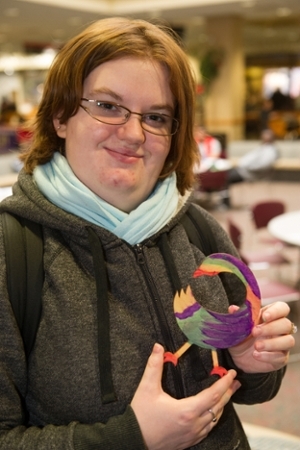 “We chose the symbol of the Sankofa bird to be used again, because students really enjoyed decorating it last year,” said Courtney Johnson, graduate assistant with Kimmel Student Leadership Center who oversees Black Heritage Month. The word “Sankofa” comes from the Ghanaian language of Twi, which means to “go back and get it” and is represented by a bird with its head turned backwards. Sankofa is also associated with a proverb that stresses the importance of remembering what has been forgotten. Sophomore Alexes Graziano, also majoring in nursing, took to the Sankofa bird, because she wants to focus on the benefits that can be gained from learning from past mistakes and achievements. The SIUE Campus Activities Board and the Black Heritage Month committee kicked off the observance with opening ceremonies on Monday, Feb. 1. See a complete list of Black Heritage Month events at siue.edu/events. 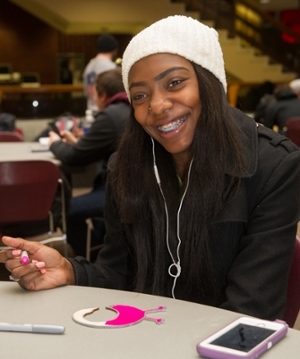 Using a fuchsia colored marker on her Sankofa bird is Jessica Reed, a freshman majoring in nursing. Two sophomore nursing students take a stress break from studies and try their hands at painting Sankofa birds. From left to right are Hannah Wood and Alexes Graziano. 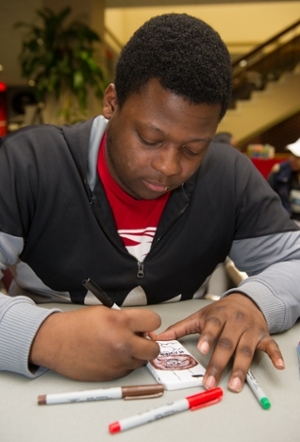 Tavis Burton, a freshman majoring in business, is working on designing the back of a plastic cell phone cover. Maddie Robinson, a freshman majoring in nursing, shows her completed artistic work.